Today. I ate only fruits. Fresh fruits at that. Far from the canned fruits in my usual diet. Even with canned fruits, though, I never would have contemplated subsisting only on canned fruits for an entire day. They stood as intermezzios between main dish meals. The way it is with the fresh fruits that are shipped to our grocery stores (in the islands for mainland readers), is that the fresh fruits arrive half ripe, and remain half ripe indefinitely. Perhaps someone thinks we islanders don't know how to roll down the window in an airplane because we never flew to the mainland before and wouldn't know a nectarine from a. Fresh fruits, half-ripe not withstanding, are expensive. Fortunately today provided an exception to the rule. Yellow nectarines were 87¢ a pound and ripe, meaning that, you didn't have to field 20 to pick out 2 nectarines. Fuji apples less than a dollar a pound, ripe as well. I ate some bananas too. Another thing about fresh fruits is that they're essentially meals ready to eat. I might attempt an all vegetable day tomorrow. But most of those you gotta cook. Unfortunately, canned fruits, the alternative to half ripe fresh fruits, is that the selection of canned fruits are limited in variety. I never quite understood why they don't can nectarines or plums. Obama: "Yes we can." Um. There's canned apricots, pears, peaches, mandarin oranges, maraschino cherries, but that's about all. Compare that to canned vegetables. Or frozen, too. Btw, this ain't one of those health kick missions to renounce meat and gravy. Et tu chicken fried steak with gravy. Suffice it to an impromptu impulse. Last night I even remembered to watch Hawaii Five-O. That kind of impromptu. They opened last night's Hawaii Five-O episode with "It's just a kiss away" (Gimme Shelter) recorded by the Rolling Stones. I enjoyed last night's Five-0, but that's because I've developed an immunity or numbness to the soap opera aspect of the script. The M.O., what a bunch of suffragettes. Btw, who was that girl working intelligence on the aircraft carrier supposedly in the Persian Gulf. McGarrett phoned her long distance from Hawaii to ask her to manipulate a spy satellite to track a black Mercedes that they were pursuing and viola the aerial video gets relayed into his I-phone all the way from the Persian Gulf. Yeah right. There's so many holes in the plot that it almost makes you suspect that the producers planned it that way to give the audience a hobby scrutinizing for errors and hey as we speak. Another example, after they ran the preview of next week's episode, there came to be a, "Be Here." Wasn't it, "Be There?" So we're seeing into the past? Warm Aloha from up da street! 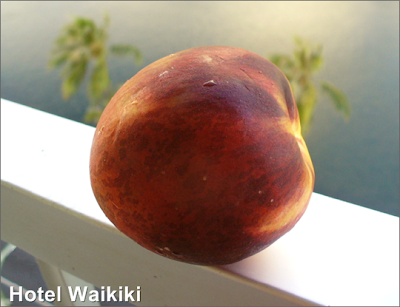 Cloudia- today's nectarines have been the only ripe mainland fruits I've eaten in eons. And here I thought that images of the lanai railing with something perched atop it had bitten the dust. Thanks RONW - you made my morning! Good for you! That's very healthy. We really do eat a lot of fruits and veggies everyday. I love nectarines, but haven't had one in a long while. Rowena- funny you should mention that, there's some imbecile downstairs pounding away to free his locked bicycle at 11:26 at night. Hope nothing just happens to topple off the railing. Kay- in all seriousness, mentioning healthy lifestyle habits do rub off on the readers. It's not a subliminal message, but I've read other bloggers healthy tidbits and there is an influence. Nate- that one gotta eat fresh, though I've thrown canned lychee in the freezer before opening the can. Use to put fresh lychee with the skin on in the freezer. There's so many lychee this, lychee that, in the stores, that there must get some giant lychee farms in some parts of the world. 87 cents a pound for the nectarines and less than a dollar for the Fujii apples? Where is your grocery store? Those are great prices! Kay- this was at Times Supermarket. Yeah, kind of rare thing.